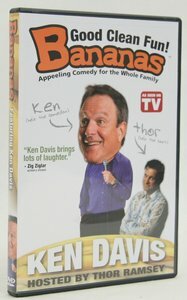 This episode of the hit TV show BANANAS features comedian Ken Davis going totally "bananas!" Watching Ken perform is as enjoyable as eating cake batter right out of the mixing bowl. His off-center views of everyday like makes you think once...and laugh twice! You'll find breathing a difficult task while laughing along with Ken Davis! BANANAS is more than just stand-up - it's hilarious interviews, as well as some comical unscripted moments caught on tape. Best of all, it's good clean fun for the entire family! About "Bananas Featuring Ken Davis"